Today’s Astronomy Picture of the Day is an image rendered in stereo taken by a Martian satellite. The depth of this image when using the red/cyan glasses is pretty amazing. 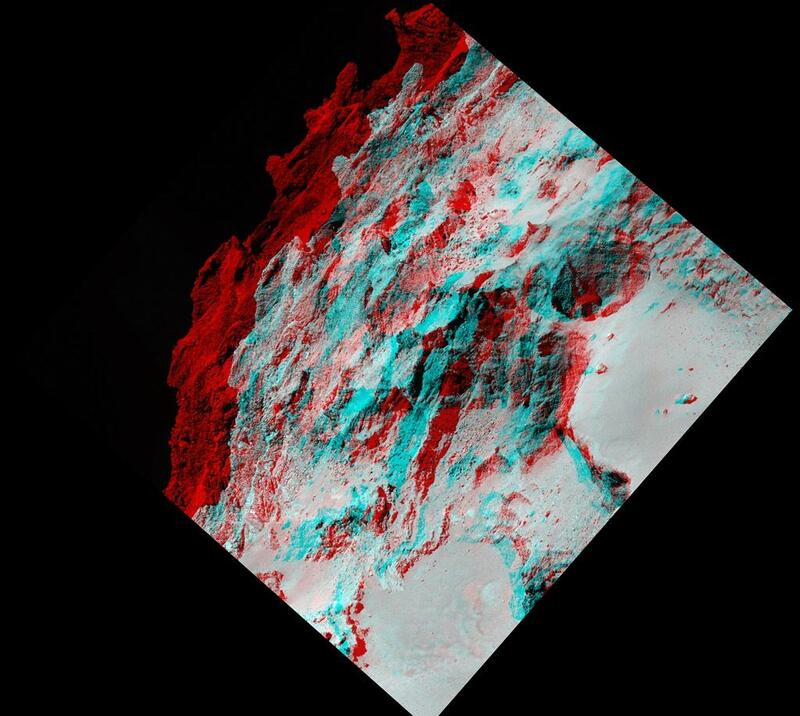 This stereo anaglyph was created by combining two images recorded by the HiRISE camera onboard Mars Reconnaissance Orbiter. The multi-level falls were created as flowing lava breached sections of the northern rim of a 30-kilometer diameter martian crater, located in the western part of the Red Planet’s volcanic Tharsis region. As the molten lava cascaded down the crater wall and terraces to reach the crater floor it left the distinctly rough, fan-shaped flows on the steeper slopes. North is up and the breathtaking 3D view is 5 kilometers wide. 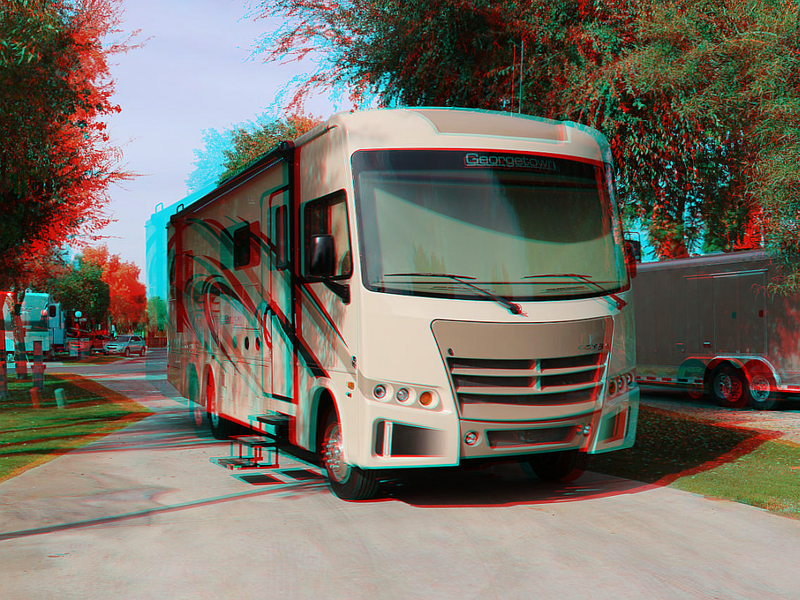 I figured a good way to demonstrate how close the new RV fits into the parking spot was to take a 3D image pair showing the overlap between the RV, the patio and the RV bedroom slide out. Click on the image to enlarge. Here are a couple of images showing the RV parked in the barely big enough parking space with slide-outs and awning deployed: image 1, image 2. Now, we have upgraded to a Class A diesel pusher which is just about the shortest in the diesel category at 35 feet nine inches. We have three slide outs and an 18 foot awning, all of which can be deployed in the space available behind the garage. But just barely. Of course, if you don’t yet have your free pair of 3D glasses to view the image above, you can see the 2D version here. Our inaugural voyage in “Road Runner,” our new Georgetown 30X3 motorhome took us to Palm Desert, CA to see Baby G and his parents. 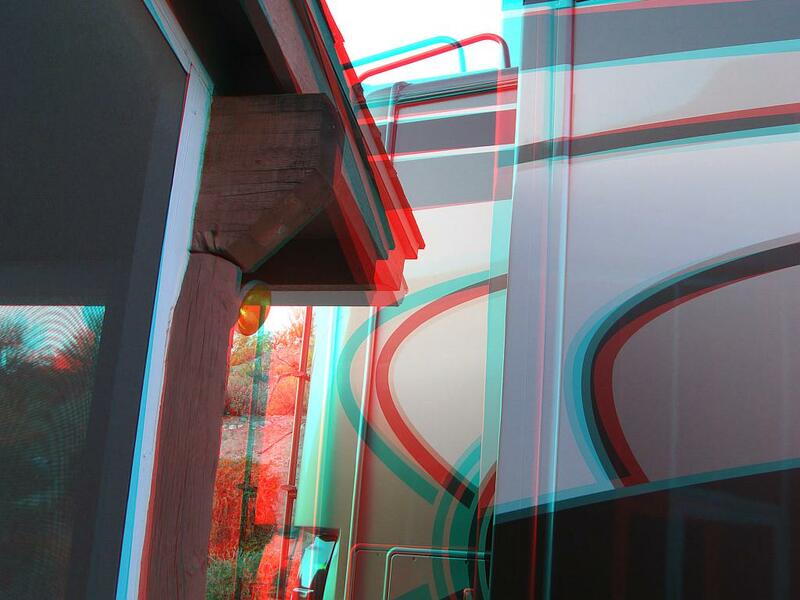 While we were in the RV Resort, I took a couple of images to merge into this nice anaglyph image of the big rig parked in our assigned space. Click on the image to enlarge. You will need your free pair of 3D glasses to view the image (click image to enlarge). As usual, I have posted a 2D image here. I also took another pair of images from the rear of the RV. You can see the 3D image here and the 2D image here. 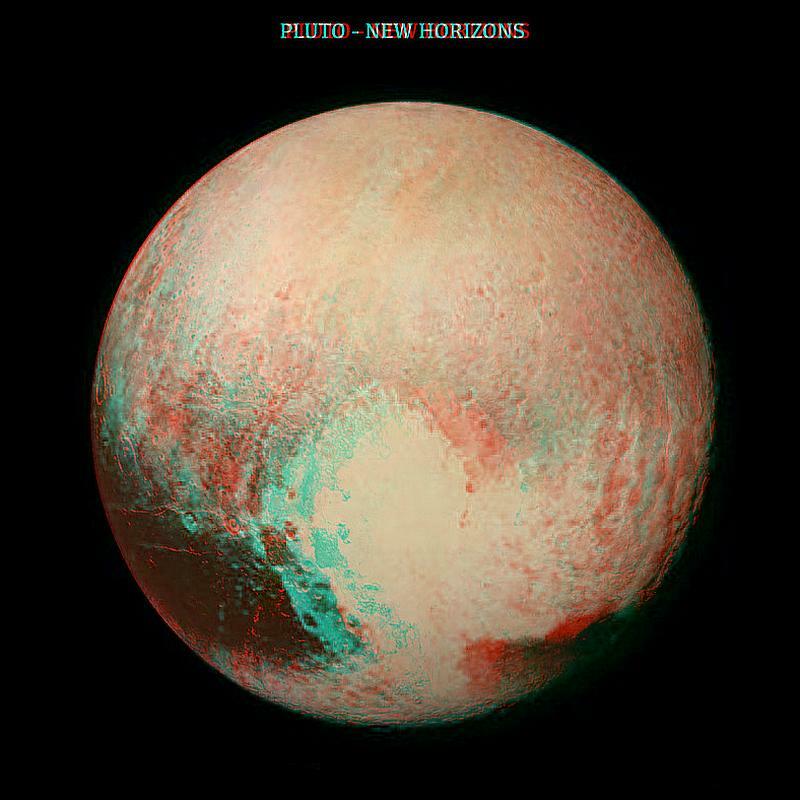 Astronomy Picture of the Day posted a stereo card (like for old-time stereoscopes) of the planet Pluto as seen by the New Horizons mission spacecraft. I took the stereo card image and combined the left and right-eye images into the anaglyph (red-cyan) image above. Explanation: These two detailed, true color images of Pluto were captured during the historic New Horizons flyby last month. 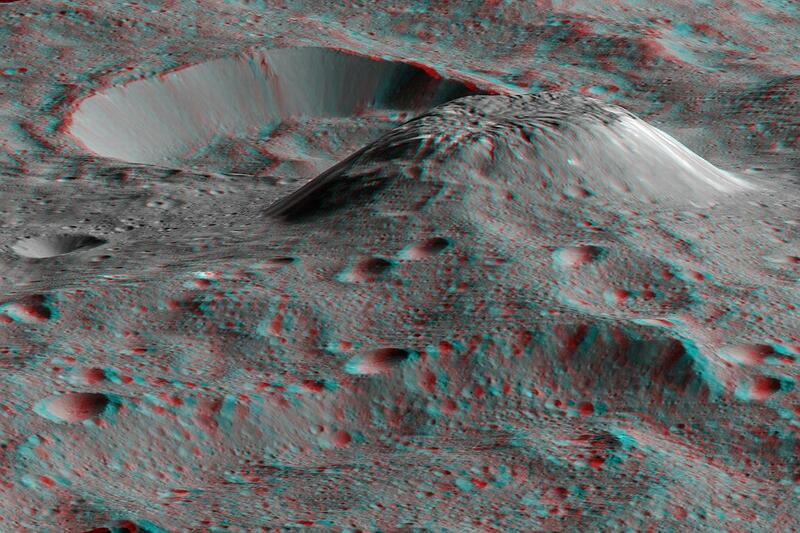 With slightly different perspectives on the now recognizeable surface features they are presented in this first high quality stereo pair intended for viewing by denizens of planet Earth. The left hand image (left eye) is a mosaic recorded when the spacecraft was about 450,000 kilometers from Pluto. The right single image was acquired earlier, a last full look before the spacecraft’s closest approach. Despite a difference in resolution, the pair combine for a stunning 3D perception of the distant, underworldly terrain. You will need your free pair of 3D glasses to view the image (click image to enlarge). If you don’t have a pair, I have posted the original stereo card here.